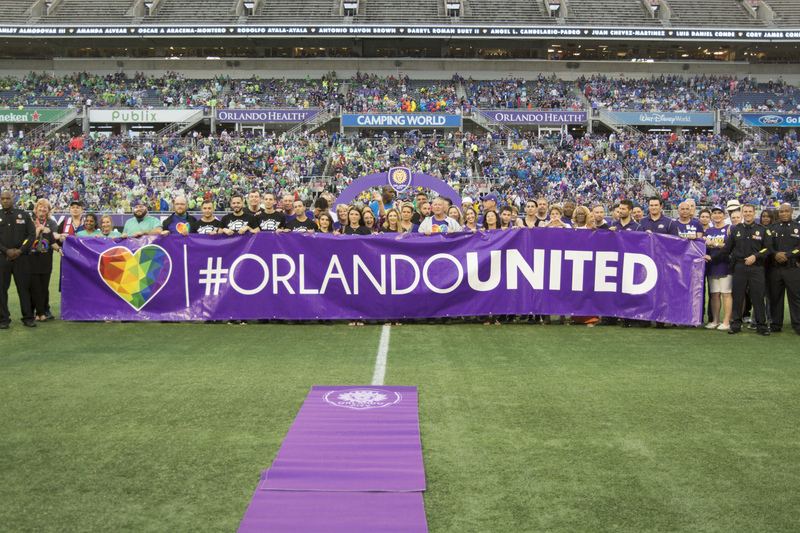 Central Florida Sports teams came together and stood Orlando United with the community after the tragic Pulse Orlando nightclub shooting on June 12, when a gunman killed 49 people and injured 68 others. It is considered the deadliest mass shooting by a single gunman and the deadliest incident of violence against the LGBTQ community in U.S. history. Still under investigation by the FBI, the Pulse tragedy is also considered the deadliest terrorist attack in the U.S. since the September 11 attacks in 2001. At Orlando City Soccer Club’s first Orlando home game since the Pulse Orlando tragedy, the team and stadium attendees paid tribute to the 49 victims who lost their lives. The June 18 match against the San Jose Earthquakes was dedicated to Pulse victims and survivors and included a pre-match ceremony. The game also featured Major League Soccer’s first-ever moment of silence during the match’s 49th minute. Orange County Mayor Teresa Jacobs joined Orlando Mayor Buddy Dyer, Orlando City Founder and President Phil Rawlins, Pulse employees, first responders and community leaders on the field at Camping World Stadium (previously the Citrus Bowl) during halftime. The group stood Orlando Strong and held the #OrlandoUnited banner together in honor of those who lost their lives on June 12. Other Central Florida sports teams that paid tribute to the Pulse victims include the Orlando Pride, Orlando Magic, Orlando Predators and Orlando Solar Bears. The teams partnered with Orlando City Soccer to benefit victims’ families and survivors through T-shirt sales and fundraising efforts for the OneOrlando Fund. #OrlandoUnited-branded T-shirts were created in blue, black and purple – reflecting the sports teams’ colors – and were sold for $22 at the Orlando Magic Team Store, online and at home games. All proceeds from T-shirt sales are being donated to the City of Orlando’s OneOrlando Fund, which benefits those affected directly or indirectly by the Pulse Orlando Nightclub tragedy. The Orlando City Foundation also made a $100,000 donation to the fund. Also benefiting the OneOrlando Fund were Orlando City’s commemorative game day posters and auctioned team jerseys at the June 18 soccer match. Orlando City also announced that the club’s new stadium, which is set to debut in 2017, will feature a permanent rainbow memorial in honor of each victim. Tributes to Pulse Orlando victims also took place at the June 18 Orlando Pride v. Washington Spirit match at Maryland SoccerPlex and the June 24 Orlando Predators v. Tampa Bay Storm game at Amway Center. To view more photos from the Orlando City Soccer Club v. San Jose Earthquakes soccer match and the Orlando Predators v. Tampa Bay Storm game, visit Mayor Jacobs’ Flickr album.